My second stop on my 2018 travel list is America; I travelled to the Niagara Falls State Park in New York State whilst on holiday in Canada. Here are seven of my favourite books set in various states around the US. Have you read any of these? Which, if any, take your fancy? Our next stop is Italy; hopefully it will fill you with springtime joy to visit the beautiful landscapes and well-paced way of life which are evoked in the following books. I received the gorgeous little Penguin edition of Arthur Miller’s A View from the Bridge for my birthday. Despite only having read two of his plays to date (rather predictably Death of a Salesman and The Crucible), I count Miller amongst my list of favourite playwrights. The foreword in this volume was penned by the wonderful Philip Seymour Hoffman, and an introduction written by Miller himself has also been included. Of A View from the Bridge, Nicholas Hynter, director of the Royal National Theatre, says: ‘[it] will always stand with the masterpieces of Ibsen, Shakespeare and Sophocles’. Written in 1955, the play, which was based upon a tale Miller was once told, tells of Italian Eddie Carbone, and is a ‘tragic masterpiece of the inexorable unravelling of a man’. 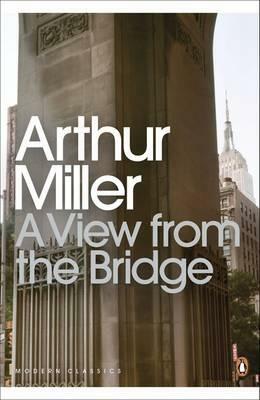 Miller speaks the way in which A View from the Bridge was ‘generally regarded as rather cold’ at first, and failed to find a large audience upon its initial Broadway run. The version of the play which is currently in print has been revised by its author, who writes, ‘I was tired of mere sympathy in the theater. The spectacle of still another misunderstood victim left me impatient… I wanted to write in a way that would call up the faculties of knowing as well as feeling’. In his foreword, Hoffman writes engagingly of Miller’s work: ‘Here we find the true compassion and catharsis that are as essential to our society as water and fire and babies and air… Miller awakened in me the taste for all that must be – the empathy and love for the least of us, out of which bursts a gratitude for the poetry of these characters and the greatness of their creator’. In A View from the Bridge, immigrant Eddie Carbone is living in a tattered Brooklyn tenement in a rundown neighbourhood with his wife, Beatrice, and niece, Catherine. In and around this location is where all of the action takes place. Eddie is a longshoreman, ‘working the docks from Brooklyn Bridge to the breakwater where the open sea begins’. Beatrice is thrilled when her Italian cousins make it off the boat in New York; Eddie less so. Miller has captured Beatrice’s reaction perfectly: ‘I’m – I just – I can’t believe it! I didn’t even buy a new tablecloth; I was gonna wash the walls -‘. A nice subplot regarding Catherine’s intention to leave school early and take up a position as a stenographer has also been inwoven. The play opens with a long monologue spoken by Alfieri, a lawyer. He talks directly to the audience, giving the context of the scene which he is both a part of and separate from. Alfieri is essentially used in place of a Greek chorus; he serves much the same function. I very much admired the way in which Miller simply yet thoroughly set his scenes; his stage directions are precise, and immediately begin to build realistic pictures in the reader’s mind. As with Death of a Salesman, the very notion of the American Dream and its failures are brought to prominence. Thematically, A View from the Bridge is fascinating. The dialogue between the more minor characters does tend to be a little repetitive at times, but the entire play is so measured and precise. Miller’s main aim in translating the original story to the stage, and the way in which he interpreted the action, were for the following purpose: ‘by knowing more than the hero, the audience would rather automatically see his [Eddie Carbone’s] life through conceptualized feelings’. Of his revision, he rather insightfully states that ‘Eddie is still not a man to weep over; the play does not attempt to swamp our audience in tears. But it is more possible now to relate his actions to our own and thus to understand ourselves a little better not only as isolated psychological entities, but as we connect to our fellows and our long past together’. For all of these reasons, and arguably for many more, A View from the Bridge is an incredibly powerful play, which I would highly recommend. The only Euripides play which I had read before compiling my Classics Club list was The Bacchae, an incredibly interesting work which I read as part of my undergraduate studies at University. 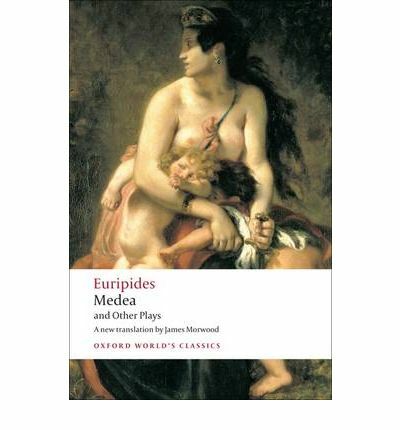 As much as I was coveting the Oxford World Classics edition of Medea (pictured), I downloaded an older Oxford University Press copy to my Kindle instead so that I could take it on holiday with me as a last-minute read. One of Euripides’ earliest plays, and one which was translated into ‘English Rhyming Verse’ by Gilbert Murray in 1906, the edition has a wordy yet thoughtful introduction: ‘The Medea, in spite of its background of wonder and enchantment, is not a romantic play but a tragedy of character and situation. It deals, so to speak, not with the romance itself, but with the end of the romance, a thing which is so terribly often the reverse of romantic for all but the very highest of romances are apt to have just one flaw somewhere, and in the story of Jason and Medea the flaw was of a fatal kind’. Jason met Medea when the Argonauts looked certain to be just days away from destruction. She was ‘an enchantress as well as a princess’, banished with her two children by Creon, who ‘helped him through all his trials; slew for him her own sleepless serpent, who guarded the fleece; deceived her father, and secured both the fleece and the soul of Phrixus’. Medea also ‘formed at the least a brilliant addition to the glory of his enterprise. Not many heroes could produce a barbarian princess ready to leave all and follow them in blind trust’. The monologues within Medea are nothing short of exquisitely crafted, and the dialogue between various players is both striking and thought-provoking. Each and every character, no matter the number of lines which they have to utter, has a distinctive voice. The whole is well textured, both geographically and historically, and the social constructs within it are fascinating, particularly when seen from a modern viewpoint. In Medea, Euripides successfully adds another layer to the myth of Jason and Medea, and probes their relationship in an engaging and absorbing manner. 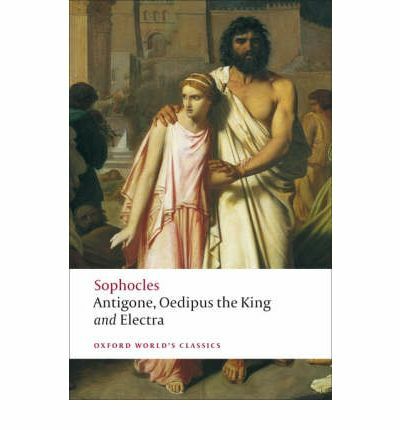 Sophocles’ Antigone is the third and final play in the Oedipus series, and the first of which I read. I believed – quite rightly with regard to my out-of-order trilogy reading this time – that each play could be treated as an individual entity, as the outstanding elements of the plot which were of relevance were covered before it began. A quick overview of the plot here is of importance. Antigone is the daughter of Oedipus, the late king of Thebes. In defiance of Creon, who has taken over his rule, she decides to bury her brother, who was slain during the attack upon Thebes. Creon inevitably finds out about this and, not willing to listen to Antigone’s explanation, decides that she should be imprisoned within ‘a rock-hewn chamber’. Haemon, Creon’s son, to whom she is betrothed, pleads for her life, and succeeds. As is the norm in such plays, Antigone is quite unaware of this, and hangs herself. Haemon is then found by her side after his own suicide attempt. As a character, Antigone is incredibly well developed. Her own musings about her impending death and what it will mean are the perfect balance of sensitivity and bravery: ‘Friends, countrymen, my last farewell I make; / My journey’s done. / One last fond, lingering, longing look I take / At the bright sun. / For Death who puts to sleep both young and old / Hales my young life, / And beckons me to Acheron’s dark fold, / An unwed wife’. Antigone is rather a slim play, and accordingly has rather a select cast. As is, almost without exception, the case in Ancient Greek plays, the entity of the Chorus set the scenes and backgrounds. Here, they do so wonderfully. They seamlessly move the story along, and place the action of the play within a very well-constructed whole. The Chorus are an incredibly moral group; they are essentially overseers who add their own judgements and sense of right and wrong to proceedings. This, too, gives the whole a wider scope. The translation which I read, by an oddly anonymous translator, was rather old-fashioned in terms of both rhythm and the vocabulary used, but I very much enjoyed the way in which the text had been interpreted. The rhyme scheme works perfectly, as does the urgency and intensity of some of the scenes: ‘Antigone, so young, so fair, / Thus hurried down / Death’s bower with the dead to share’. Emotions have been well considered throughout. Antigone is not my favourite play, but it is a most interesting and enjoyable one nonetheless. In it, Sophocles provides us with a fascinating window upon the ancient world. A series of flash reviews of American Literature seems a fitting interlude to post amongst the extensive reviews of late. These have all been posted on the blog over the last couple of years. I adore the Deep South as a setting and am wondering why, after finishing this stunning novel, I’ve not read any of Faulkner’s work before. I adored the differing perspectives throughout, and the way in which each and every one of them was so marvellously distinct. The story is such an absorbing one, and I love the idea of it – a family waiting for and commenting upon the death of one of their members. Faulkner’s differing prose techniques in use in As I Lay Dying are wonderful, and show that as a writer, he is incredibly skilled. Terribly sad on the whole and very cleverly constructed. I have read some absolutely marvellous reviews of this novel, and couldn’t wait to begin it. The prologue of Let The Great World Spin is visually stunning and well thought out. If only the rest of the book had been the same! I enjoyed the author’s writing on the whole – some of his descriptions, for example, are sumptuous – but my stumbling block came with the characters. They were interesting enough on the whole, but they were all so broken, often by alcohol and drugs. Because of this, no distinct characters stood out for me, and I found it difficult to empathise with any of them in consequence. An interesting novel, but a little disappointing by all accounts. Summer days warrant these witty, fun reads for me. The books which Cohn and Levithan write are not your usual teen fare. Rather than being fluffy, simply written and overly predictable (sorry, Sara Dessen, but I’m looking at you), their tales are smart, well constructed, intelligent in their prose and rather unique in terms of the cast of characters they create. Yes, I suppose that there was an element of predictability here with regard to the ending, but the entire story was so well wrought that it really didn’t matter. The characters are all marvellous, with perhaps the exclusion of Naomi, whom I found to be an incredibly difficult protagonist to get along with. I loved the way in which Cohn and Levithan tackled serious issues – the rocky road of teen friendships, homosexuality, trying desperately to conform with peers, and so on. Naomi and Ely’s No Kiss List is a great book, and one which I struggled to put down. As with the delightful Breakfast at Tiffany’s, I got straight into these stories from the outset. I love the stunning sense of place which Capote never fails to create, and his characters are both marvellously and deftly constructed. His writing is just perfect. The tales in Children on Their Birthdays are short, but boy, are they powerful and thought provoking. Williams portrays relationships, even the most complicated, in a masterful manner. I love the way in which he writes. His characterisation is second to none, and he gives one so much to admire in each scene, each act. The characters were all fundamentally troubled souls, each imperfect in his or her own way, but they worked so well as a cast, and Blanche Du Bois is eternally endearing. Williams’ dialogue is pitch perfect. An absolutely marvellous, perceptive, strong and unforgettable play, and one which I’m now longing to see performed.